Our trip to Japan was shamefully short, but it was one of the best trips I ever had in my life. Here was where the journey was so much more enjoyable than the destination. The locals were the most helpful people I’ve ever met, and their kindness was incredibly touching. If there’s one thing I’m sure now, it’s that I want to go back to Japan, and to go back as soon as money permits. If you could afford it, go. Be amazed at this rare breed of human beings and their wonderful culture. Let me share with you my short trip itinerary and the expenses that went along with it. I hope you find this useful when you travel to Japan. With our home base being Osaka, it was very easy for us to go out of the city to visit other places in Kansai. However, it also took some chunk of time to get to and from Kyoto, our most visited destination. If you would spend a lot of time in Kyoto, I suggest that you base yourself there if budget and room vacancy permit. 1. Our first day was so hectic. Ideally, people spent half a day in Hiroshima and an overnight in Miyajima. Himeji was supposedly another day trip. However, we had to make do with what we had and made the choice to cram all three in one day. It was tiring, yet it was nonetheless a good sampler of what Japan has to offer. If you’re following my lead, make sure to catch the 11:55 AM shinkansen nozomi train to Hiroshima from Himeji to make the schedule work. 2. 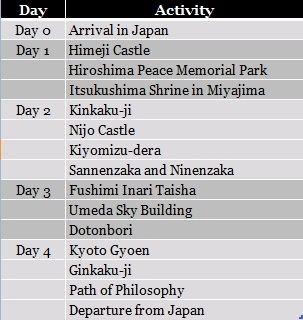 For Kyoto and Osaka, make sure to divide the places into half-day schedules. Building your itinerary by block allows the easy changing of schedule if the need arises. This proved to be useful especially in spring when weather is very unpredictable. 3. Don’t forget the walking part in your scheduling. The attractions were vast, and some were located on top of hills. If you do number 2 above, make sure that you don’t have two tough half-days. Pair a tough one with a lighter counterpart. As most visitors to Japan, I am happy to say that Japan isn’t as expensive as we thought. As long as you steer clear from taxis and fancy meals, then you’d not spend a lot there. It’s not going to be as cheap as Southeast Asia, but it won’t be as expensive as Europe or America, I guess. We got tickets from my least favorite carrier in the Philippines, Cebu Pacific. I know, I reneged on my plan to never fly with them again, but who can turn away from such low price for a round-trip ticket to Japan? The good thing was that our flight was only delayed for an hour going there, and on time coming back. Such a sweet deal for the pocket, but be prepared for less-than-average service on the ground and onboard. 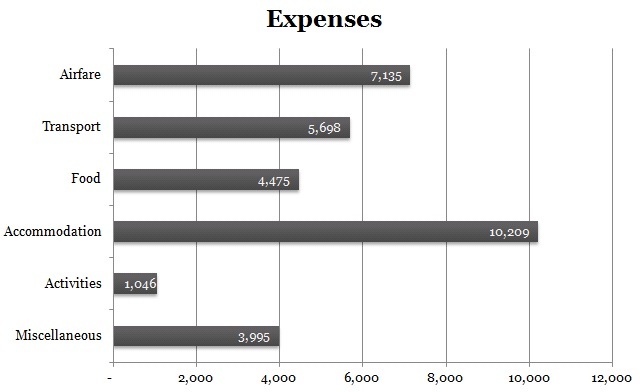 A chunk of our transportation expenses went to the Kansai-Hiroshima Pass (JPY 13000). Without this pass, we wouldn’t have gone to Hiroshima and Miyajima. We also used an ICOCA card (JPY 2000) to minimize the time to buy tickets and used a one-day Kyoto unlimited bus pass (JPY 500). Hotel ate a third of our budget, unfortunately. Because of the odd size of our group, coupled with a pre-peak season, we had to shell out more than expected and to stay in Osaka. Cheaper options, though, like staying in hostels or traditional houses (which are a no-go for the older folks I traveled with) or renting an apartment (which only had one bathroom usually) are available, but we chose to stay at the side of comfort and just paid a little more. Most of the places we visited had entrance fees, but were luckily reasonable such that it didn’t distort our budget too much. 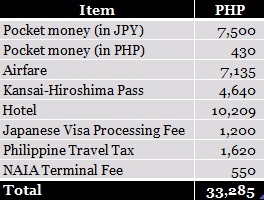 Most of this were pre-trip expenses, such as visa processing fees (P1200). The government also took its share (P2170) for taxes. Others were souvenir items such as magnets and chopsticks and an emergency shopping of gloves, which I believe was the best investment ever (my hands were just freezing at that time).